← Sustainable Homes action group launching! Although the weather seems not as bad as it was last summer, average temperatures are still 1 – 2°C higher than the long term average, and heat waves are tending to be hotter and longer. Tragically, quite a few friends and neighbours from Guildford and surrounding suburbs have recounted the terrible upset of losing hens to heat stress. Summer’s not over yet, so now is a good time to review what you can do to prevent deaths due to heat stroke, and to reduce heat stress in your backyard hens. The body temperature of chickens is higher and more variable than that of mammals; in adult hens it ranges from 40.6 – 41.7°C. Smaller breeds tend to have a higher body temperature than larger ones, probably due to metabolic rate. Activity increases body temperature, and chickens that are growing or producing a lot of eggs will also have a higher average body temperature. A hen’s high average body temperature makes it easier to lose heat into the surrounding air, but like humans, this happens most easily when air temperature is well below body temperature. The ideal air temperature range for chickens at which their body functions best (the ‘thermal neutral zone’) is 18 – 24°C! Hens therefore begin to experience a degree of heat stress above 24°C. Just like people though, the temperature range that chooks can stand depends on the length of exposure, and what protection they have. Birds do not have sweat glands, so they pant to evaporate moisture for cooling, and to draw into their air sacs deep in the body to cool it. Hens will start to pant above 32°C and above 50% relative humidity. However, panting for evaporative cooling loses effectiveness above 70% humidity, greatly reducing birds’ ability to tolerate heat. The lethal upper limit for body temperature for chickens is 45 – 47°C. Chickens are at risk of death from heat prostration at air temperatures above 38°C. Both hens below are panting – breathing through open beak instead of nostrils. Small hens such as the bantam hen on the left have a higher body temperature than larger hens, and are thus more susceptible to heat stress. The Isa Brown hen on the right has some feather loss, which likely helps to release body heat. Fresh drinking water must be freely available at all times. Hens will drink twice as much at 38°C compared to 27°C. This can be as much as 400 – 500mL per average sized laying hen per day when it’s hot. The longer hens are exposed to high temperatures, the more they will drink (i.e. they drink more on the last day of a heat wave than the first day). Hens that are at their peak of lay will drink 50% more than average egg layers. If you have a broody hen that is not actually sitting on eggs when a heat wave is expected, consider taking measures to discourage broodiness at this time. If hens are incubating eggs, make sure they have access to water at all times and are located in a deeply shaded area. If no one is at home on very hot days, consider inviting a neighbour to check on your hens during the hottest part of the day. Checking shade and water, providing a sprinkler briefly or adding ice cubes to water may mean the difference between life and death. Heat stressed rooster panting (breathing fast with an open beak). 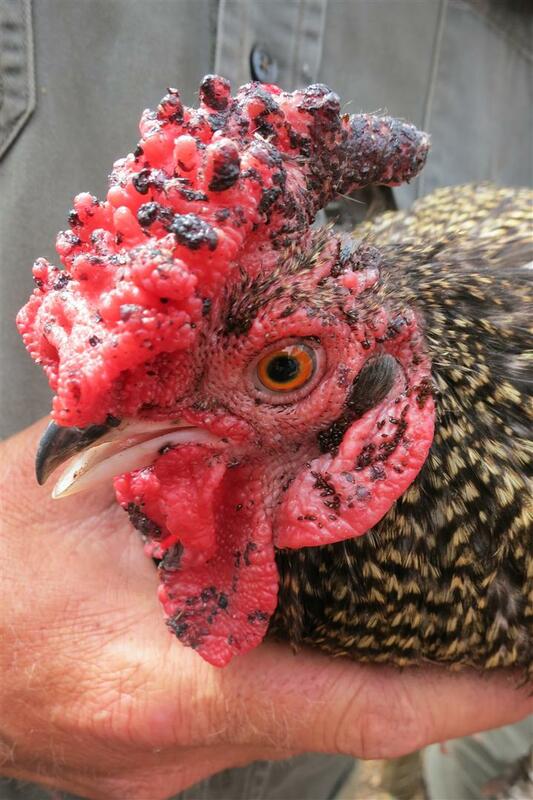 Note the very bad infestation of stickfast mites all over his comb and wattles (black). This entry was posted in Flora & Fauna, Food, Sustainable Home, Uncategorized, Waste & Recycling and tagged Backyard Chooks, Chicken care, Chickens, Growing food, self-sufficiency, Sunny Side Up, sustainable food production. Bookmark the permalink. Thanks Barb, very helpful comments, putting some ice cubes into the drinking water for my chooks right now!